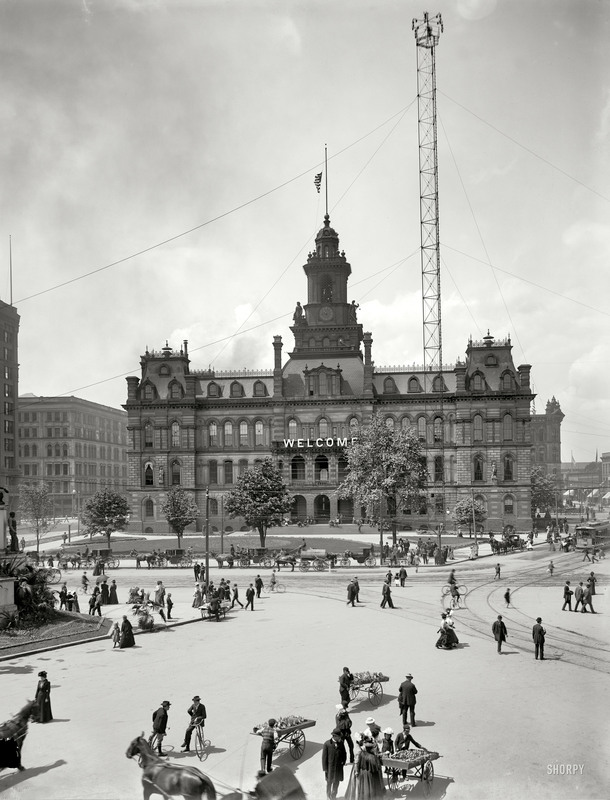 Single photo: 1901 Detroit - Woodward Avenue at the Campus Martius showing Bagley Fountain. What do you think that flag is, as well as what's on top of this weird tower? What else? On top of the weird tower looks a lot like a cell phone tower...no clue on the flag. It sure does look like a cell tower. wth? this seems odd to run this tower so high up (and with lights on the top???). i guess they wanted to go high so that they could run the wires down to the buildings? hmpf. Austin’s moonlight towers have long been a distinctive part of the city’s landscape, their lights casting a gentle glow on the streets 150 feet below. Though Austin’s fifteen surviving towers are now the last of their kind, this form of street lighting was once common across the United States. Many cities erected tower lights in the 1880s and 1890s, and Austin’s system was modeled closely on Detroit’s, then the most extensive in the world. The first practical source of electric light was essentially a sustained spark, or arc, between two carbon rods. Though highly efficient, such arc lights had a serious drawback: their glare was too intense to be endured at close range, yet there was no way to make the arc smaller without extinguishing it altogether. The carbon rods also burned down quickly; those in the first arc lights lasted just an hour or two before they had to be replaced, though later models could last through the night. Different flag, same corner, photo undated, but it's the US flag. Is it just some weird proprietary/business flag? those are some interesting lights. Would be nice to see one of the old ones. Contemporary look different. The bottom of the tower has an interesting solution as well. In the street center to the right of the "Blackstone Cigar" ad sits a round kibosh with a ball on top. could it be Mercury and electricity? What do you think that flag is, as well as what'son top of this weird tower? What else? The flag issue is somewhat muddled as of now. Company, charity, school, city, state, country, military? We will get to the bottom of that sooner rather later. What is clear, Detroit sits on an unusual combination of rock, salt and water formations. This creates a type of magnet field that helps mask certain types of signals and radiation. The people that built the Star Fort knew this. So yes energy has been generated for a long time in Detroit. The city has many 3000 feet deep Salt mines under about 30% of Detroit. My first trip to Detroit , 1967 ,was testing security on an underground missile base located in the city unbeknown to any civilians. The 1880-1930 Detroit had quit interesting towers and balls. I am presently looking for a local source of mercury. And these Roman statues all over the place. There could be only one possible explanation for those people etecting these statues. They reflected on their own lives. But imagining togas being worn in the 18th, 19th centuries is tremendously hard. Interesting lighting here in this modern photo. I don't know if this could be related, but I have been noticing these lately around many buildings, which apparently were built in the 50s. Something tells me it ain't just decoration. Most don't have the antenna like this one, but could we still be building these types of devices? 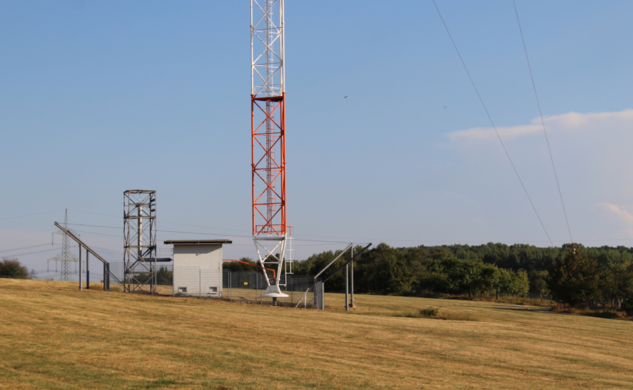 There is a second moonlight tower in front and to the right of the distant steeple visible through the nearest towers framing. There is what must be a 'bulb' hanging to the right of the wheel at the base of the tower. There is a crane outside the 'lake' something awning in the detroit opera house with large white objects inside the fenced area which appears to be connected to the 'works' going on inside that trio of arches which look to have had their windows removed and yet the fence is arranged to allow pedestrians free passage right in front of them. At the base of a support tower holding wires which run up to and past to the moonlight tower (the three wires are attached to the left leg of the tripod with an insulator but they go on without seemingly making a connection with the tower itself) right next to the horses standing at the taxi rank looks to me to be a transformer as its dimensions are the same or very similar to the ones the welders used in that shipyard i once worked in. There is a man leaning against another transformer at the base of the moonlight tower itself at the end of the row of horse taxis. As for the flag it shares letters with the sign (weirdly obscured) at the first floor level. What i find interesting is the state of the road its immaculate. no idea what it is made of though although there are bricks of some description between the tram tracks. In most American cities the lighting tower infrastructure was combined with arc lamps placed on poles or hung at intersections, and complemented with gas or and oil lamps, or incandescents. Detroit was the only large city in the US (and in the world) lighted wholly and exclusively by the tower system. Detroit placed 122 towers (see illustration at left and at right) with a height of 100 to 180 feet, lighting 21 square miles of the city. All towers were installed in the 1880s and remained in use up to the end of the 1910s. Wiki says it was created in 1908, but would explain the "vertical striped flag"
The Latin words speramus meliora and resurget cineribus mean, respectively, “we hope for better things” and “it will rise from the ashes. Now why would Detroit proclaim 'it will rise from the ashes', I wonder? Thanks to the link in this thread Detroit Publishing Co 19xx photos. Extra high resalution! What about water fountain under pyramid. How can you imagine clean drinking water in the center of city coming from underground? Is structured water coming from it? The Pyramid coupled with water magnifies the Pyramids natural electrical properties. It would seem that having an underground river running under the Pyramid will give off an electromagnetic field. Adding another river or artificial tunnel with running water perpendicular to the first river will increase the energy output and possibly change frequency. My opinion. Change back to the moonlight towers. Most technology is ancient , just repackaged. The towers by themselves make no sense. Lets explore a little ,starting with the obvious. Every structural steel shop in the country uses a form of the below described. In popular use, the term arc lamp means carbon arc lamp only. In a carbon arc lamp, the electrodes are carbon rods in free air. To ignite the lamp, the rods are touched together, thus allowing a relatively low voltage to strike the arc. The rods are then slowly drawn apart, and electric current heats and maintains an arc across the gap. The tips of the carbon rods are heated and the carbon vaporizes. The carbon vapor in the arc is highly luminous, which is what produces the bright light. The rods are slowly burnt away in use, and the distance between them needs to be regularly adjusted in order to maintain the arc. Wikipedia. What you do not see is the ultra- violet light. You probably wondered why the moon lights were intentionally left operating sometimes twenty four hours straight, and so high above the ground? The below comments reflect the healing powers of ultra- violet light and you will see why the technology had to be suppressed. A major breakthrough in photophysics came in 1865 when Maxwell proposed a theory that light and sound are part of a larger spectrum of energy with wave-like properties. He called them "electromagnetic waves" because he believed that they were generated by the interaction of electric and magnetic fields. In 1882, Maxwell's theory was confirmed by Hertz who developed a means for measuring microwaves, the first empirical evidence for radiation beyond the UV-visible-infrared spectrum. His results reinforced the belief that electromagnetic radiation travels in waves at discrete frequencies (or wavelengths). Although heliotherapy has been practiced for at least 2400 years, there was very little objective evidence supporting its purported therapeutic influence. By the 18th century, reports began to appear in the medical literature indicating that sunlight ameliorated different skin diseases. In 1735, Fiennius (cited in 31) described a case in which he cured a cancerous growth on a patient's lip using a sunbath. In 1774, Faure (cited in 30) reported that he successfully treated skin ulcers with sunlight, and in 1776 LePeyre & LeConte (cited in 28) found that sunlight concentrated through a lens accelerated wound healing and destroyed tumors. There were also reports that sunlight had beneficial effects on internal maladies. In 1782, Harris (cited in 31) used irradiated mollusk shells to improve a case of rickets (fragile bones). In 1815, Loebel (32) used facial irradiation to heal a case of amaurosis (partial blindness caused by disease of the optic nerve), and in 1845, Bonnet (33) reported that sunlight could be used to treat tuberculosis arthritis (bacterial infection of the joints). In 1879, Martin (34) used stripes of blue and white light to treat progressive degeneration of the optic nerve. Additional observations indicated that sunlight was capable of altering basic human physiology. In 1843, Scharling (35) measured reduced production of CO2 in subjects at night, and in 1866 von Pettenkofer & Voit (36) reported that serum bicarbonate levels were lower at night. In 1850, Berthold (37) found that hair production was greater in the daytime, and in 1888 Feré (38) noted that breathing and pulse rate were reduced under red light. These results were supported by similar data from animal studies (see below), but it would be well into the 20th century before the notion of daily (circadian) rhythms would take hold. Probably the most remarkable claim during this period was the positive influence of sunlight on mental health. This idea can be traced back to Hippocrates (cited in 39) who recognized that depression was more common in the winter months in Greece when there was less sunlight. In 1806, Pinel (39) identified two types of seasonal depression, one occurring in winter and another in summer. By 1845, his student Esquirol (39) documented several cases of both types of depression. In 1876, Ponza (40) reported that light therapy was beneficial for treating patients with mental illness. In particular, he found that violet-blue light was useful for reducing mania, whereas red light improved depression. During the 20th century, phototherapy would be rediscovered several times as an effective means for treating seasonal affective disorders [Hasselbalch (41) Siebeck (42), and Lewy, Kern & colleagues (43)]. In spite of the widespread success of red light therapy, there was no agreement as to how it worked. In 1893, Finsen (50) speculated that the chemical rays were detrimental to smallpox patients, although he provided no evidence for this nor did he offer any explanation as to how such rays might aggravate the disease. Four years later, he showed that chemical rays had the opposite effect in the treatment of lupus vulgaris (cutaneous tuberculosis). In this case, he demonstrated that the chemical rays from sunlight or an arc lamp had antibacterial actions (see section below on microorganisms) and that, under appropriate conditions, it cured the disease. For this accomplishment, he was awarded the 1903 Nobel Prize in Physiology or Medicine and endowed with financial support for the Finsen Light Institute in Copenhagen. Between 1900-04, Bie (270, 271) used a carbon arc lamp and liquid filters to confirm that violet-blue and UV rays were lethal to bacteria. He also noted that oxygen was not required for the UV effect (272). In 1901, Strebel (273) showed that UV rays from cadmium and aluminum arc lamps were more powerful than sunlight for killing bacteria. Bang (274, 275) reported that B. prodigiosus exhibited different sensitivities to UV rays from metal arc lamps. He recorded lethality with 340-360 (UVA) and 200-300 nm (UVC + UVB), although the latter region was more effective, and lethality increased at warmer temperatures. In 1903, Barnard & Morgan (276) used a prism and several types of arc lamps to confirm that the greatest bactericidal action occurred at emission lines between 226-328 nm (UVC + UVB). Once absorbed, light was understood to affect the body's appetite, blood, organs, nervous system, and psyche. Metabolism was raised, natural immunity was stimulated, and muscle tone was improved. 31 Sickly, malnourished patients gained weight and the bones of rickety children straightened (Fig. 1.5). Tuberculous lesions expelled necrotic bone and tissue then closed with excellent scarring (cicatrisation), as did wounds and burns. For arthritic patients, the joints eased with the help of infrared light, which was known to penetrate deeply into the body and relieve congestion by increasing blood circulation. Psychologically, the light exhilarated the mind and enlivened the spirits, bringing feelings of happiness and well- being. 32 Equally destructive and stimulating, light was a natural panacea in the eyes of its most ardent proponents. Now we know that the plants, the environment,humans, animals are all tied to the sun, also we know that ultra-violet light controlled will heal plants, disease, mental conditions, mend bones and reduce the need for most health care. Whats not to like? What astonishes me about this is not simply the building, the tower nor the fountain, but the practically HD quality of this turn of the 20th century photo. This is something people in the Mandela Effect/Retcon community have noticed, it's almost like technology in the past is improving, coming closer to what we might have hitherto only expected in this modern day and age. Is the past really changing or have old photos always been this high quality? Perhaps it is to do with old negatives being developed with modern techniques.. I shall have to look into this further. I am aware that with photographic film there is almost no limit to how high res you can blow them up, given the right developing technique and resources. But then coming from this period, with this photographic technology, you would expect some dust and grain in the image. Growing up in the sixties there were still cast iron and brass 'public drinking fountains' in use in various parts of the town I grew up in including the public park. They were connected to the water main, the two survivors probably still are but like anything else useful and free of charge, like public toilets, they have been put beyond use/closed down. So my money would be on the pyramid fountain being similarly piped. The fountain in my avatar might be similar to what you describe, but is one-piece solid stone, impeccably 'carved' with no errors, chips or anything. Not too shabby for 'early 20th century' construction. Anyway, it's found in a park in the city of Melbourne, Australia. And not unexpectedly they've put a metal drinking tap in the centre of it, connected to the city's water main. I wonder if it was even a fountain initially.